On Tuesday, January 31, we and our sister organization, Raise Your Hand, delivered hundreds of letters from Illinois parents and community members to the offices of Senators Durbin and Duckworth. Before the delivery, we hosted a press conference and a rally. Our message was clear: Just vote no! The following letter was included in the delivery. Senators Durbin and Duckworth each received a copy, addressed separately. At the time of delivery, Senator Duckworth had publicly stated that she would vote no. We did deliver a thank you with all of her letters. At the time of this event, and now, Senator Durbin has not stated publicly how he will vote. Secretary of Education, Betsy DeVos poses a unique threat to the public education system here in Illinois and nationally. 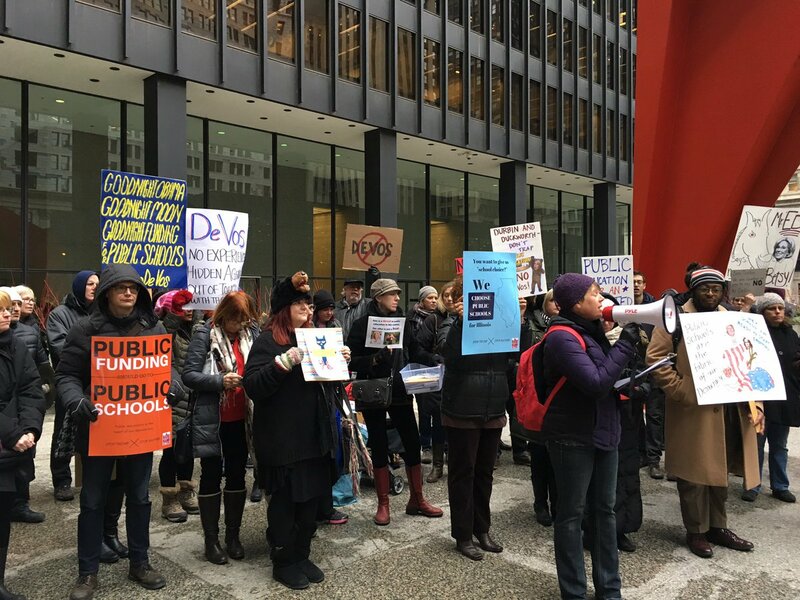 We represent thousands of parents in Chicago and Illinois who have seen how the privatization of public education has already drained resources from our schools and handed public dollars over to private hands, diminishing the transparency and accountability necessary to preserve healthy school systems. This will only worsen with the appointment of Betsy DeVos. We that you publicly declare you will not support Betsy DeVos for Secretary of Education. Public schools are the foundation of our democracy and must be preserved and strengthened. They are the place where students of all races, religions, health, and sexual orientation can get a free and appropriate education. Betsy DeVos lacks basic knowledge of public education policy, has called public schools a “dead-end,” and oversaw a disastrous transformation of the Detroit school system where 80% of the schools are now for-profit charters with no regulation or accountability. Our country was founded on the principle of the separation of church and state, yet Betsy DeVos believes in using taxpayer dollars to fund private and religious schools, which don’t have to adhere to the same laws as public schools. Betsy DeVos’ nomination constitutes the greatest threat ever to the viability of Illinois’ and our nation’s public schools. Thousands of Illinoisans have called your office to ensure that you’ll vote no on DeVos. Yet, you haven’t made a clear public statement on how you’ll vote. We count on your leadership to oppose her and oppose any policy that will further harm our public school system and affirm unconditionally that public dollars are for public schools only. Thank you to everyone who wrote a letter, made phone calls, and attended this event or others! Sign up to receive our emails so we can continue to advocate together. MSNBC Live: RYH board member & CPS dad, Eric Reyes, participated in a roundtable discussion about the DeVos nomination.